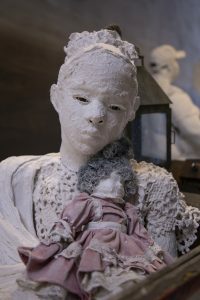 It is hard not to be swept away by Muddy Water, a new work by Karon Davis, her second breathtaking and emotionally powerful installation at Wilding Cran Gallery. Her first, Pain Management was in many ways a tribute to her late husband Noah Davis, whereas Muddy Water is an homage to the thousands of victims of natural disasters. 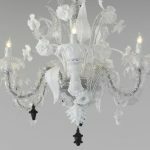 The two-part installation is awe-inspiring and relevant. 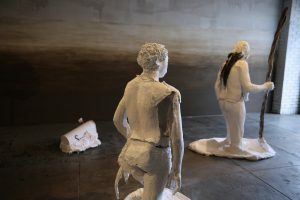 It is necessary to pass through the space by the many white plaster figures with brown-eyes to reach the denouement, George Bush Doesn’t Care About Black People (and Neither Does Trump), 2018, located in the smaller back gallery. Here, Davis has created a facsimile of a shingled roof angling from a dilapidated gold-patterned wallpapered wall toward the floor. Two children are on the roof, one seated the other standing, pointing toward the ground (water) where there is a fragment of a shark’s tale. 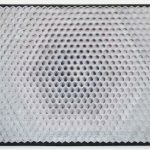 The scene is surreal and seemingly impossible, but Davis suggests anything can happen in an unpredictable environment. 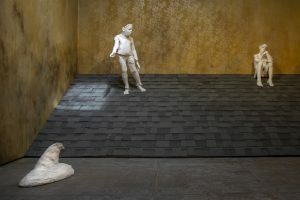 In the main space, Davis has transformed the gallery into a disaster zone, covering the walls with a mud-colored wash that recalls a flooded river receding into a cloudy grey sky. 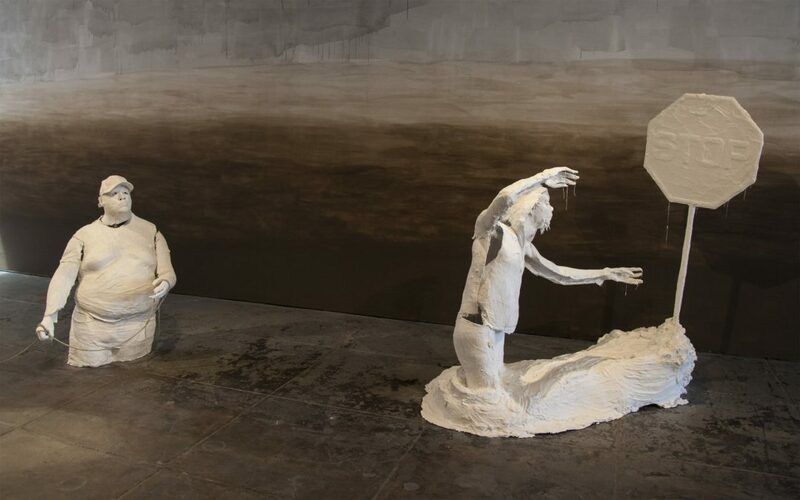 Facing the gallery entry is a procession of life-size white plaster figures, each modeled on a newspaper image from a recent disaster– be it fire or flood. 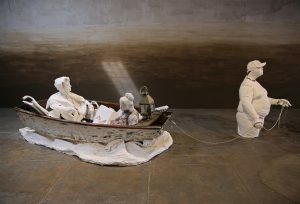 By entitling her installation after a Bessie Smith song about the great flood of 1927, Davis references the myriad disasters caused by natural forces, suggesting the cyclical nature of these occurrences. Personally affected by the Thomas Fire in 2017, Davis understands the disruptive nature of unexpected natural disasters and the imbalance of resources available to those in need. 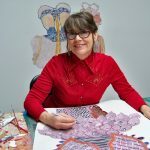 Her work reflects both private and universal crises. While Davis’ plaster characters recall the work of George Segal, they have black rather than white facial features. The figures in Muddy Water are depicted from the knees or waist up, as if emerging from a body of water. Each figure — Davis includes, men, women and children– has piercingly alive big brown eyes that imbue their roughly sculpted faces with longing. Among the cast of characters is the leader, a long-bearded and dread-locked figure holding a wooden staff; a young boy who rides on the back of his father above the water; a woman with a water jug balanced atop her head and a man wearing a baseball cap who tugs a small wooden boat with a woman and young girl sitting inside. Scattered within the boat are a smattering of objects including a doll and a guitar — the minimal keepsakes they could rescue from their flooded home. 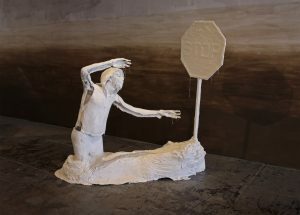 One of the most dramatic scenarios portrays a young man reaching out toward a stop sign; an anchor point to keep him from being swept away by raging waters. While Muddy Water is about the plight of evacuees, it is not about their hopelessness. Rather, Davis is interested in the global effects of climate change on both the environment and people, and how they come together to survive. 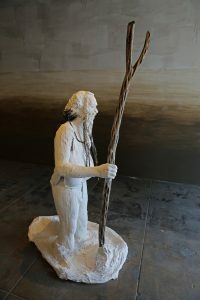 Davis’ sculpted figures are drawn from images of the flooding in Montecito, Puerto Rico and Houston. It would be possible to add recent events like Florence to the array of natural disasters breaking apart communities across the globe and in many ways, that is Davis’ message: That no matter when or where, catastrophes like fires and floods displace people, wreak havoc and bring out the best and worst in mankind. 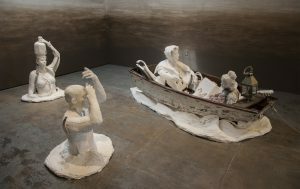 The plaster figures in Muddy Water are both fragile and sturdy simultaneously. 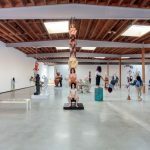 Davis has built them with large voids so as to reveal their armature — the metaphorical backbone that keeps them standing and moving forward while piecing together the cast body parts as an incomplete coat of armor. The figures’ faces are their emotional core, rendered with enough detail to evoke both awe and sympathy. The ghost-like plaster casts reference real human beings, yet also sign for the endless nameless victims who vanish without a trace. 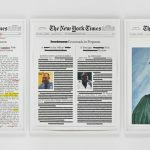 This review was originally published by What’s on Los Angeles, October 25, 2018.